Heritage Walk on Old Varanasi Serpent Lanes. observe the Hindu rituals near the Assi and Dashashwamedh Ghats in Ganges river popularly known in Banaras, city of Light, surrounded also by many narrow Lanes and Temples. Varanasi’s Old City near the banks of the Ganga river has crowded narrow winding lanes, flanked by road-side shops and scores of Hindu temples. 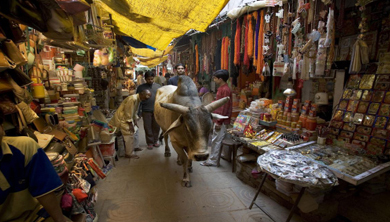 As atmospheric as it is confusing, Varanasi’s labyrinthine Old City has a rich culture attracting many visitors. 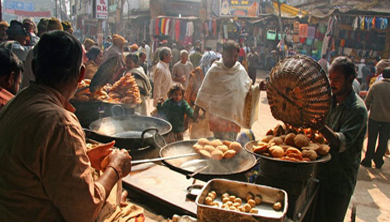 The lively and labyrinthine Varanasi streets famous for their hidden historical gems, are also home to some of the most delectable desserts and street food options, whose recipes have been perfected over centuries. Join us as we walk through the bylanes to the best of the food joints savoring Malaiyo, Tamatar Chaat, Kalakand, Malai Toast, Maalpuas, Gol-Gappas, Banarasi Paan and much more! 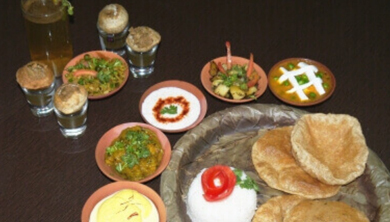 And relish in not just the mouthwatering delicacies, but also hearty conversations with their Banarasi makers. Cooking Classes with Lunch / Dinner at Brahmin Family (Pure Vegetarian Food). you'll learn much more about Indian cooking than you would simply eating at local restaurants. Learn to make Masala chai and snack on pakodas, then take lessons on pulao, dal (lentils), eggplant, raita, roti (flat Indian bread), vegetables, and halwa for dessert. Sit down to eat your meal with your fellow classmates and chef/teacher. 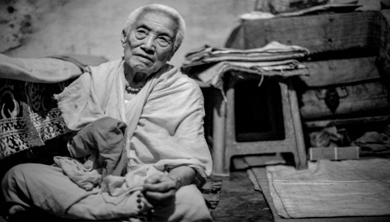 In India it is considered that being a widow is a curse and a widow brings sufferings to the family. Thus, death of husband gives total loss of finance and women are often considered a burden. Widow houses or Widow Ashram is an effort to give shelter to these orphaned and ostracized women. In Widow Ashram these widows find shelter, clothing, food and sometimes employment with efforts of philanthropists. Private Boat Tour with Ghats Visit. Start your day with a morning boat ride at dawn. 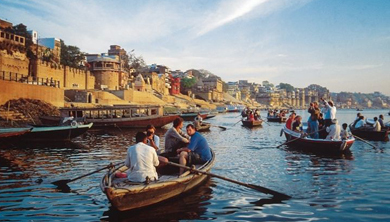 You have a chance to observe the Hindu way of life along the bank of the Ganges River (Ganga Ghat or Banaras Ghat). 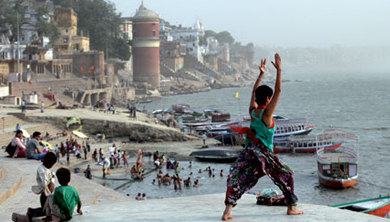 Varanasi presents a unique combination of physical, metaphysical and supernatural elements. Some of the prominent and popular Ghats at Varanasi are the Dasaswamedh Ghat, Manikarnika Ghat, Harischandra Ghat, Assi Ghat, Shivala Ghat, Man Mandir Ghat, Darbhanga Ghat, Ahilyabai Ghat and the Kedar Ghat. After the tour is concluded, we will take you back to your hotel. This crumbling 17th-century fort and palace, on the eastern bank of the Ganges, is a prime attraction, but the eccentric museum has some interesting displays and the attached Vyas Temple is a beautiful place to watch the sun set over the river. There are vintage American cars, jewel-encrusted sedan chairs, a superb weaponry section (including a lion trap and a sword with two pistols attached) and an extremely unusual astrological clock – along with plenty of dust and evidence of rodents. 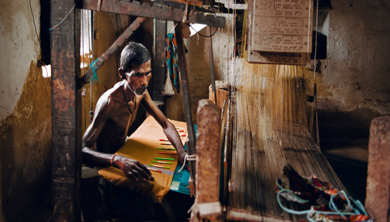 creating the world-renowned Banarasi (other name of Varanasi) silk sarees. The silk sarees of Varanasi are one of the finest silks in India and are noted for its fine quality, intricate brocade work, and stunning embroidery. No wonder the saree is a favorite among ladies on festive and special occasions, it makes for a great gifting option as well which is worth the investment. After tour ends, you will be dropped back to your hotel. Private Yoga Session at Varanasi Ghat with Boat Ride. 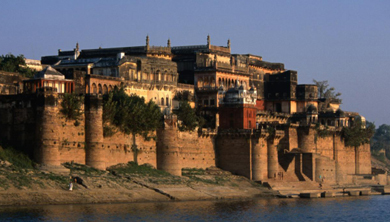 Pick-up point to as per the scheduled Itinerary and boat ride from Dashashwamedh Ghat to Manikarnika Ghat and Manikarnika Ghat to Shivala Ghat. Beautiful and colorful view of the river in soft lights or pilgrims that come to perform the Morning Prayer to the rising sun. Manikarnika Ghat (the burning Ghat) is the most propitious place for Hindus to be cremated. Explore Varanasi, a land of literature, culture, aesthetics, art and extreme spirit with Banarasi Masti. After Boat Ride, the Yoga Instructor meets at Ghat and take you at the pre-identified spot for the Yoga and Meditation. Later you will be dropped at the hotel. Boat Ride on Shared Basis.